Marni's favourite winter accessory would have to be her scarves. Although she does not get much chance to wear them as it really does not get that cold where she lives, she still has a huge collection. So for this layout she decided to do a mini photo shoot of herself wearing her favourite scarves. 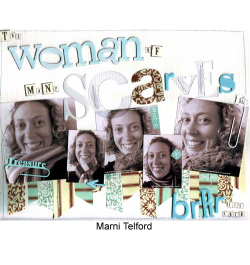 Marni chose to work with two double sided pieces of Carolee's Creations patterned paper for this layout. She used one that was in cool wintery colours and a contrasting one that was in warm winter colours. The best part about using this patterned paper is that you get four patterns out of two pieces of paper. On this layout Marni also used the winter rub-on from the For Keeps onsert. She cut it up and used the word on one photo and the snow flake on another. As you are probably aware Marni loves to sew on her pages but sometims the machine stitching is not thick enough for the look she wants so to thicken the stitching up she uses the back stitch function on her sewing machine. 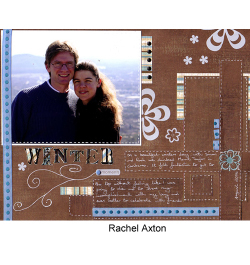 With this layout Rach decided to celebrate winter, and did a layout about her husband and herself. 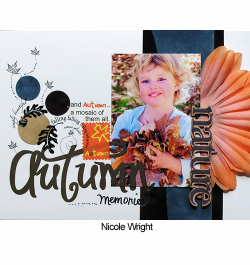 Rach wanted to keep this layout fairly simple and in theme with the colours white, brown and aqua. Rach used a layering technique with the background papers. With the rub-ons she has used the Scenic Route Carnival letters and rubbed them onto her Carolees background paper, then cut each letter out - this gives a funky title which was also colour coded. Rach also added her favourite rub-on of the moment from cherryArte. Mel lives in Tasmania and it's fairly cold most of the year, so when they recently had a 30 degree day in September it was a pleasant surprise. It also left everyone wondering when summer would finally be here so they could enjoy more days of splashing in the backyard under the hose. 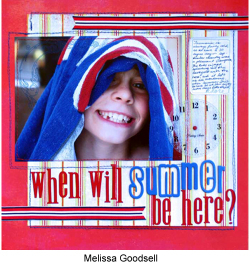 Mel wanted to keep this layout looking bright so she combined the BasicGrey Tribal and Rom patterned papers which really lifted the photo of her son James wrapped in a beach towel. The Heidi Swapp journaling spots are perfect to use when you only want to journal a small amount for the layout. Caz can tell when spring is in the air, because she gets hay fever. Caz is lucky it is usually only quite mild but it does send her rushing to the chemist for some tablets and extra tissues. Caz has used the Junkitz spring bandana and seeds papers to tie in with the photo. BasicGrey rub-ons were added to the Junkitz double-playz and secured to the page with brads. The large rub-on was added to the spring plaid paper and then cut out to form the centre of the the half daisy. 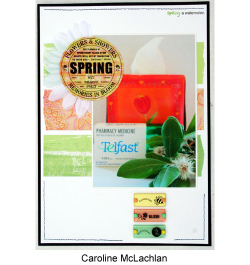 Caz used the Carolees Creation Onsert from the For Keeps Magazine to continue the seasons poem. Tamar was so excited to be able to make a layout using snowflakes! Living on the Gold Coast its just doesn't snow. Tamar adores this photo of the girls - they were about 9 months old and she had found these beautiful fluffy hats. You can see by their rosy cheeks they really didn't need them to keep warm - but they just looked so adorable. 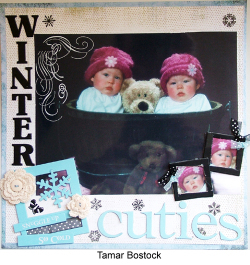 Tamar has used BasicGrey rub-ons - just the various snowflakes from the winter rub-ons - over the background to add interest. She also pulled apart a Heidi Swapp chipboard winter theme set to create the wintery accent. The whole layout was inspired by the chipboard snowflake - Tamar was determined to get that in somehow and she is so pleased with the results. Autumn with colours of browns, golds, oranges, really is a beautiful season. This photo is of Nic's daughter playing in the leaves last autumn whilst they visited friends in Orange. Nic has used a mixute of BaiscGrey, Junkitz and the Carolees Creations rub-ons. Again she has created a little collage of rub-ons, this time showing that the rub-ons will easily stick to the SEI velvet papers, which Nic has cut using circle punches. Nic has also added a Heidi Swapp orange flower, folded it in half and attached it under the photo, then placed a Li'l Davis Vintage word over the top of the flower, overlapping the photo too.